If you're in Richmond, you know the city is a whirlwind of preparations. The 2015 UCI Road World Championships are coming in September and there is much to do! One project we're excited about is the ie* Go Bike! community art project. 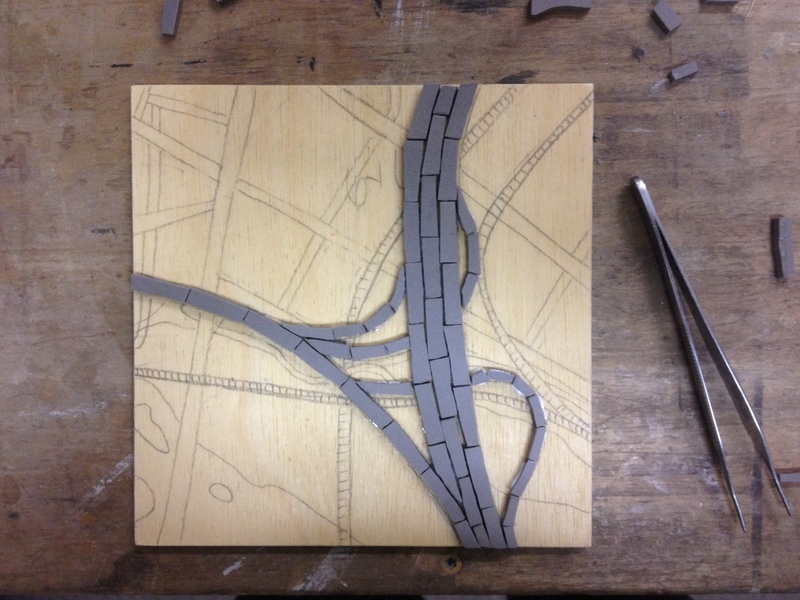 This project consists of 30 collobarations between local artists and identical sculptural castings. 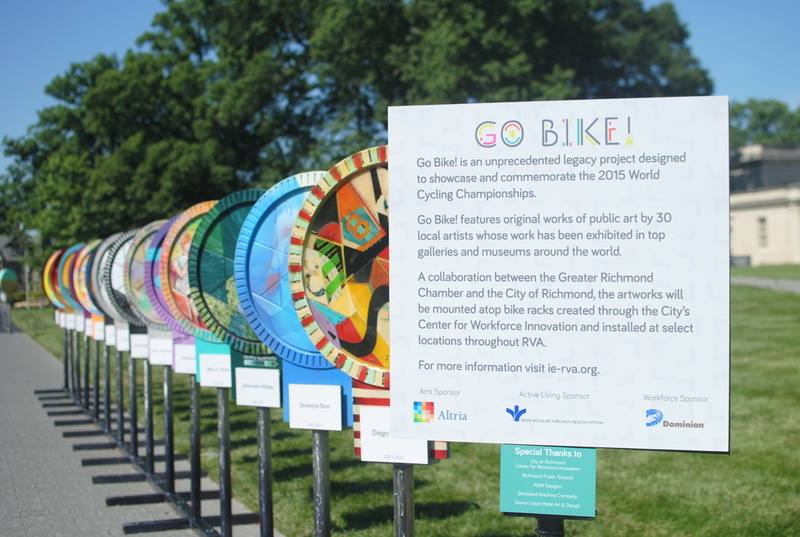 The sculpture itself was designed by VCU student John Sampson to reflect the city of Richmond and the international bike race. Johannah was thrilled to be selected as one of the artists for this project. First step to ready the sculpture for paint and mosaic was to clean it. Next we sprayed it down with an aluminum sealer. Once that was complete, I could start playing with lines and color for the design. A string of events inspired the design for this piece. 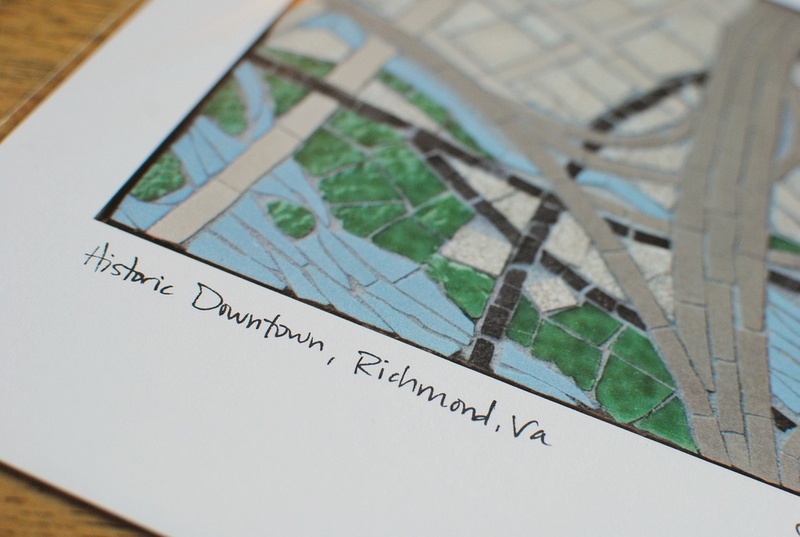 Last summer, I created a series of mosaic maps of the Richmond area. Soon after, I was excited to learn of a research project created by Housing Opportunity Made Equal (HOME) called Mapping RVA: Where You Live Makes All the Difference. 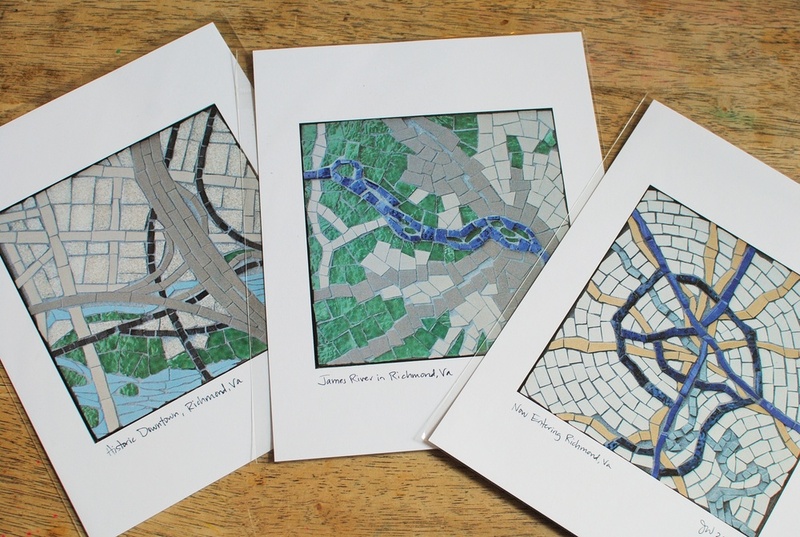 The maps used in this project reflected many of my thoughts about Richmond while working on my own maps. 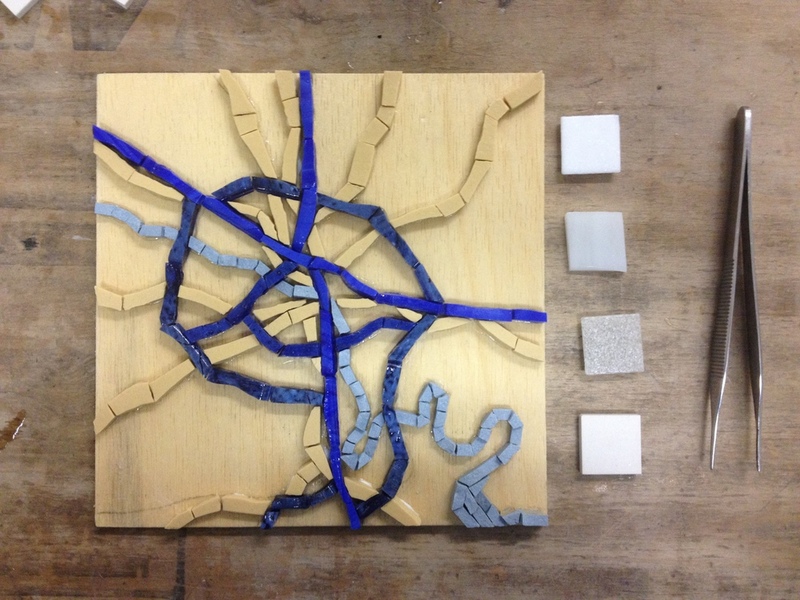 When the proposal for the bike rack project came through not too much later, I immediately knew the HOME maps would be the foundation for my project. (See the top right corner of this photo.) One side of the bike rack is based on the Educational Opportunity map, while the other is based on the Housing Opportunity map. There were so many new challenges with this project. From finding an exterior-grade adhesive for bonding non-porous glass and aluminum, to the visual and physical logistics of combining paint, glass, and grout, to painting letters. I have a much deeper respect for sign painters these days! Though I would have loved to cover the entire piece in mosaic, time was short for mosaic. I think the final combination of paint and glass turned out to be one of those happy accidents in art. Still, it was a challenge to my self-confidence to put a painted work (not my primary medium!) out into the world. By September, the bike racks will be installed separately around the city. But first they're being exhibited all together at the Virginia Museum of Fine Arts for three weeks. On the day of the opening reception for the exhibit, I awoke to the surprise of finding myself on the front page of the local paper! I expected this story to be buried deep in the arts section. This was just the first indication of how excited the city is about the bike racks. I think the community spirit and group effort have a lot to do with the great reception. One of the many reasons I'm honored to be a part of this project. I have to say, I'm pretty excited to have my art work in the same space as not only 29 other great local artists but also world-reknowned artists like Jun Kaneko (middle photo) and Dale Chihuly (right photo). The show comes down next Monday, July 6. Stop by the VMFA sculpture garden this weekend for one last chance to see these beautiful works of art togethe in one spot!